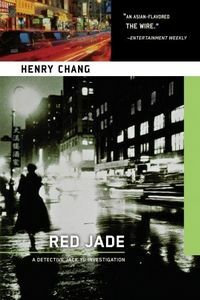 Red Jade by Henry Chang, a Mysterious Review. Review: An unambiguous murder/suicide opens and seemingly sets the stage for Red Jade, the third mystery in this series by Henry Chang and featuring NYPD homicide detective Jack Yu. But this case has little to do with what follows, Yu spending most of his efforts tracking down a mysterious woman implicated in another investigation. Johnny Wong has been jailed for the murder of Fat Uncle Four. He's in protective custody, but is unsure from whom he is being protected … and who arranged for his protection. Yu believes Johnny to be innocent — indeed, he probably is — but his alibi, the victim's mistress, known only as Mona, has disappeared. A clue from another case involving the Ghost Legion — a Chinese gang into all sorts of criminal activities, one with which Yu has had considerable interaction — leads him to the Seattle area, where, in a somewhat convenient, if not contrived, manner, Mona has fled. The storyline gains traction and moves forward in an orderly manner once Yu hits Seattle. But isn't the primary selling point of this series a cop in conflict with his New York City Chinatown roots? Having Yu leave the confines that made the series so engaging in the first two books seems to lessen its appeal here. Red Jade remains an interesting police procedural … but somehow not an altogether special one. Acknowledgment: Soho Press provided an ARC of Red Jade for this review.